Mount Meru is a great preparation hike for climbing Kilimanjaro, or a spectacular trek for those not compelled to do Kilimanjaro. You will hike past wildlife, the landscape is spectacular, and sunrise on the summit has Kilimanjaro as the backdrop. While typically done in only 4 days, it is not an easy peak to summit. To reach the top, there is some scrambling on rocks in the dark and at high altitude. You should be prepared for at least 10 hours of hiking on summit day. For an easier hike, you can climb just to Rhino Point for sunrise, and then descend. Mt. Meru is in Arusha National Park. The park requires all groups to be accompanied by a park ranger. This ranger is employed directly by the national park. He will carry a rifle, which is available to scare away any advancing animals such as elephant or cape buffalo. You will also have your own guide, who is managing the crew and watching out for your safety. 815m / 2670ft Overnight at Arusha or Moshi and briefing from your guide. 4 to 5 hours hiking Starting from Momela Gate, the track passes through open grassland with cape buffalo and warthogs. With luck, you may also see giraffe and elephants. Continue a steady climb through montane forest. You can have your lunch at the famous “Fig tree”. After lunch, the trek continues through less dense forest, where there are lots of birds and monkeys including the black and white colobus. By mid-afternoon, there are the first close views of the towering cliffs and the Ash Cone. Miriakampa Hut, situated in idyllic grassy glade, is reached in time to enjoy the afternoon sun and beautiful views over the surrounding plains towards Kilimanjaro. 4 to 5 hours hiking The walk from Miriakampa Hut to the saddle below Little Meru is a a steep sustained climb all the way. Starting through beautiful and lush montane forest, the path continues beyond the halfway point of Elephant Back Ridge and carries on uphill through the giant heather and other moorland vegetation to reach Saddle Hut and lunch. 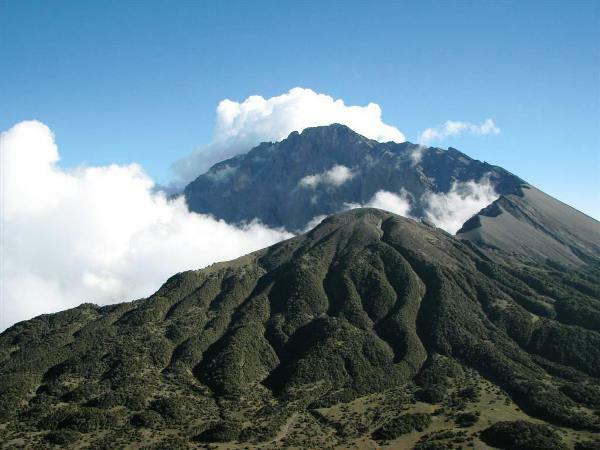 In the afternoon, you can make the short climb to the nearby summit of Little Meru (3820 m / 12,533 ft) for superb views. It takes about 1 hour to walk up and 30 minutes to walk down. The ascent is 1056 m / 3465 ft. Summit day has an early start at around 12:00AM. There is a 1 hours steep climb to Rhino Point (3800m / 12,467ft), then the path continues along a ridge of ash and rock to reach Cobra Point (4350m / 14,272ft). The summit of Socialist Peak (4566 m) is an hour more on a steep path wih magnificent views of Kilimanjaro. Depending your speed, you can enjoy sunrise at Cobra Point or the summit. The views are stunning: the cliffs of the Crater rim, the Ash Cone rising from the crater floor, Kilimanjaro floating on the morning clouds, and the Rift Valley. The route back to Rhino Point in the sharp morning light along a narrow ridge between the sloping outer wall of the crater and the sheer cliffs of the inner wall is one of the most dramatic and exhilarating walks in Africa. Brunch and a brief rest is taken at Saddle Hut before continuing the descent to Miriakamba Hut.NOTE: For an easier climb, you can start the trek at 05:00 A.M., hike for about 1 hour, and enjoy sunrise at Rhino Point before going back to Saddle Hut for breakfast and then descending.NOTE: In raining conditions or in strong winds, it may be impossible for anyone to progress beyond Rhino Point. 2+ hours hiking There are two ways down from here. You can descend the route you came up or walk down the jeep road, which descends to the lower crater floor. You pass through the well-known Fig Tree Arch and can visit an impressive waterfall hidden in a ravine not far from the road.A fast descent through open grassland and mixed forest, with good chances of seeing wildlife. This trail has excellent views back towards the crater and over the plains of the National Park. Momela Gate is reached by late morning.Overnight at your hotel in Moshi or Arusha. NOTE:Mount Meru can be done in three days which involving getting down straight to the Momela gate after summit.